Get Unlimited Outlook MSG files converted to NSF file. Supports MSG files of all Outlook Version i.e. 2016, 2013, 2010, 2007 etc. With the help of MSG File to NSF migration tool, you can convert unlimited msg files to lotus notes nsf file format. The best part of the software is that it only creates the single .nsf file for multiple msg files. After conversion to nsf, you can easily import nsf files. The MSG to NSF file converter software provides enhanced premium date filter option. 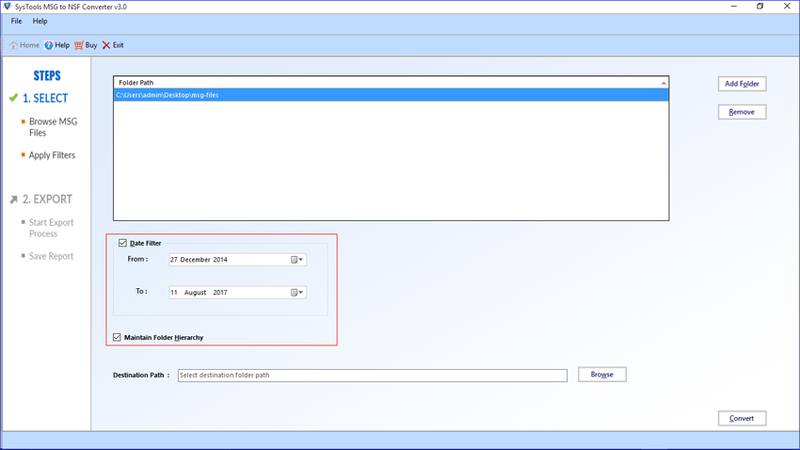 By using date filter, you can convert and import data specific to the date range. 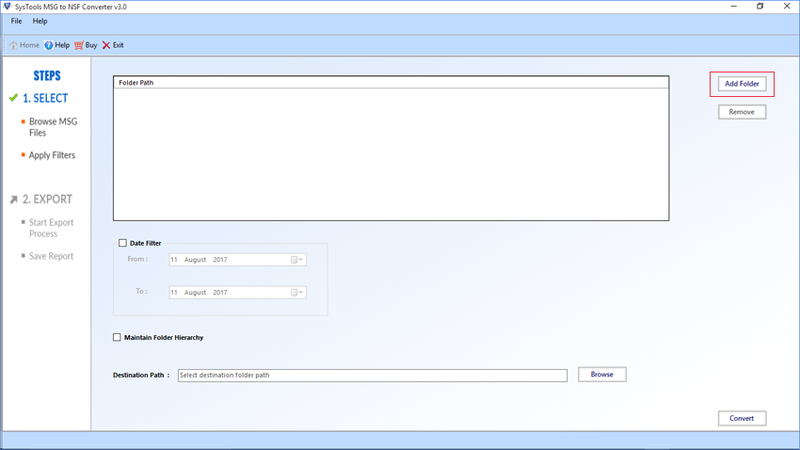 For this you have to provide date range From and To. Then convert msg file to lotus notes nsf automatically filtered data for you. 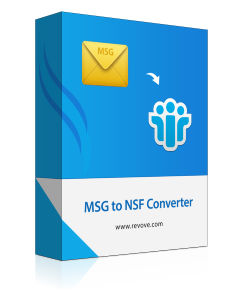 Convert MSG to NSF software sustains the hierarchy of the folder and the subfolder structure cautiously. By doing so the user can effortlessly access the same folder structure like in the original structure before the conversion Outlook MSG files to NSF. To import msg files to lotus notes. The software provides the facility to convert and import selected files and folders. The user can export the required folders and files of Outlook MSG by selecting the boxes provided against each data items. The Outlook MSG file to NSF Converter software supports all the versions of Outlook i.e. 2016, 2013, 2010, 2007 etc. The tool can easily be installed on the any version of Windows operating system such as:-Latest Windows 10, 8, 7 etc. Demo version of Outlook MSG to NSF File Converter Software allows Converting and Saving first 25 Items from each folder. Support: Windows10, Windows 8 & all below versions of Windows. Disk Space: 5 MB of free disck space. Does the software support the MSG files of Outlook version 2007? Yes, the software supports the msg file created by the Outlook version 2007 and other later version also. Can I install the software on my Windows 10 on the virtual machine? Yes, you can install the MSG File to NSF Converter on Windows 10 machine provided that enough space is available for installing the software on the virtual machine. Will the software manage the internal folder hierarchy of resultant nsf file? Yes, the Outlook MSG to Lotus Notes NSF file migration tool provides the functionality to manage the internal folder hierarchy of the resultant nsf file. Can I save the nsf file at desired location on my system? Yes, You can save resultant nsf file at desired location on your system. How can export only select items to Lotus Notes NSF file? For this, you can use date filter option provided by the msg data to nsf file software. I have collection of some old days Outlook MSG files and I want to access it into lotus notes email client but does not find any sophisticated solution which makes my task easy and simpler. Then someone has recommended using the MSG File to NSF Converter. Seriously, I am impressed with the performance of the tool. It brilliantly does the complete work for me in quick time. Thanks for such software. I used the Outlook MSG to Lotus Notes Converter software for the better efficiency in the conversion of msg files to nsf file format. The date filter option and the maintains folder hierarchy is out of the box innovation. I previously used much software for the same but the result was not satisfactory. But now I am fully satisfied with this tool. Thanks to developing the team for development of such nice software.